New Book: Now on Sale! This entry was posted in Art, Books, Creativity, Nature, Photography, Poetry, Publishing, Writing and tagged Art, Book, Books, Connecticut, Cosmology, Creativity, Ecospirituality, Independent Book Publishers Association, Jen Payne, Mindfulness, Nature, Photography, Poetry, Spiritual Ecology, Spirituality, Storytelling, Writing. Bookmark the permalink. 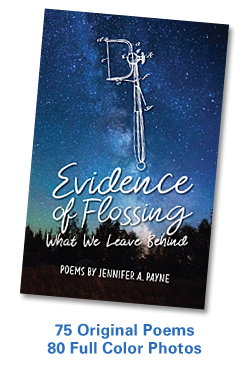 ← Looking for Evidence of Flossing?